APANAMA: UKRC - Yang Berhormat or Yang Berbohong ? 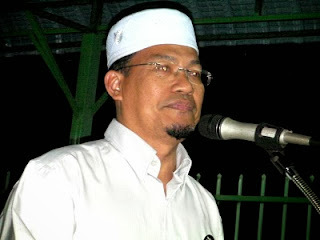 Did PAS' Hulu Kelang state assemblyman Saari Sungip (seen above in white skullcap) make empty promises and/or tell blatant lies to his constituents? The Ulu Kelang Recreation Club (UKRC) folks are very sure he did just that, and they are not taking it sitting down. Some residents have sent the Pakatan Rakyat representative a clear message - See you in court YB! Yang Berhormat or Yang Berbohong? The best way to settle this maybe is to seek court decision. Politicians make promises based on prevailing circumstances. When things are fluid, decisions have to be amended. Just as the PM promised to lower (and not maintain-which would have been less risky)toll rates, he ahd to make an about turn and increase them. In any case it would have been better that the UKRC grounds be opened to public and allow more people to use it. If the YB had 'bohong' it is excusable as it is overall a decision that is good for more people. Bohong is a playthings of politician, of they don't lie they are not politician, very clear and big liar is ketua pkr...he has been lying for years, why don't we ourselves not listening to them.. we know who can deliver who cannot deliver..ones who make lots of promises are the biggest lier..so Malaysians,,, wake up don't get cheated over and over.. vote those who can deliver... present govt. can deliver...may not satisfy but better than none. Please go to court because all the residents nearby also was given runaround by UKRC regarding their shady accounts and them maintaining exclusivity in club membership. Memang lah they all going to court. You can't read izzit? The club is dragging MPAJ and the Yang Bohong to court. Anon 12.48, how come all residents became so interested to join the club? For sure there must be a hidden agenda, including yourself? Why all these years there were no talk to join the club by the residents? Real puzzling right? I am sure UKRC is doing a good job and the rightful owner of the recreational land, otherwise how can they be there for so long? Its a shame, a Wakil Rakyat lies and cheats its voters. BN tak rampas padang. Pakatan rakyat rampas padang dan Wakil rakyat bohong ahli-ahli kelab. Apa alasan PAS Selangor terhadap Haji ini? Cakap tak serupa bikin. Pernah duduk SELCAT, kononnya!! Cukup bukti yang Wakil rakyat PAS ini telah bohong kelab UKRC dan pengundi Hulu Kelang. PAS harus pecat dia. Satu pengajaran kepada pengundi Hulu Kelang. Kesian UKRC. Saari sekarang menyokong aktiviti haram di Hulu Kelang. Yang mencari kebenaran diabaikan. Pergilah ke Kuala Ampang dan lihat sendiri bangunan-bangunan haram di Tanah Kerajaan. Kenapa tak ambil tindakan? Pada hal ada padang awam berdekatan UKRC yang tidak dipedulikan oleh MPAJ. Padang yang dikawal oleh UKRC dirampas oleh MPAJ. Wakil Rakyat berdiam diri. Memang patut untuk pengundi Hulu Kelang menyaman pembohong PAS ini. Ini adalah tamparan yang hebat bagi pengundi Kuala Ampang. We take it as a lesson for future vote. Whoever cannot deliver his job, we just vote them out. Yang Bohong, you are a big liar. You can't deny what you have promised to UKRC. The whole world now is watching the video clip. Another video clip which MPAJ snatched UKRC is really cruel. This is not humanity at all, especially the people around watching and clapping their hands are worst than the dog. UKRC, we resident of Kuala Ampang wish you all the best in the hearing on 13 Jan 2014. We fully support you till the end. Fight for your right, fight for our future generations. Jelas, Saari Sungib pembohong. Lagi berbahasa Inggeris pulak tu di video. PAS Selangor, tutup satu mata ke, bila Wakil Rakyat PAS tipu pengundi dan rakyat? Nak tawan Putrajaya konnony, mimpi aja lah. Isu kecil UKRC pun tak boleh selesai!! Saari Sungib pembohong, Azmin Ali, buat apa pulak ya? Keluar hanya masa pilihanraya saya ke? Sri hartamas, for your information, UKRC ground is open to public, as my football team has booked the field through UKRC and played there many times. Its a wonderful field and truly a community club. I admire the committee's good work. It seems that the Pakatan Rakyat government just makes empty promises. Also scary to note of Saari Sungib's broken promise, as seen in the vide. Yang saya tahu, Yang Bohong ini, hanya manis di bibir aja. Isu tanah runtuh kat Kemensah pun sampai hari ini tak dapat diselesaikan. Memang patut pengundi Ulu Klang saman dia di Mahmkamah, kalau tak dapat tunaikan janji. Anon 12.48, the club management is not answerable to the residents lah. Its duty is only to members of the club. You don't know club law is it? Shady accounts ah, why don't report to Registrar of Societies? Check your facts first!!! Don't be a laughing stock or a comedian!!! YB yang menyokong UKRC tiba-tiba mengalih sokongan kepada pertubuhan-pertubuhan yang menjalankan aktiviti haram di kampong kuala ampang untuk mengkukuhkan kedudukan beliau di PRU ke 14. Jijik betul Saari Sungib. Tidak dapat membezakan yang bersih dan kotor, sebagai seorang Islam! Bila pilihanraya dekat, saya janji, bila menang, saya akan selesaikan isu Tanah UKRC. Bila dan menang, saya janji, saya akan rampas padang UKRC untuk memuaskan kumpulan perjudian dan along di kampong yang dapat mempengaruhi pengundi-pengundi BN menyokong saya. Wakil rakyat yang tidak ada maruah, Saari Sungib. Gosh…you people are having a gala time here mud-slinging, stone-pelting, name-calling at YB Saari Sungib ! Having fun ? Enjoying yourselves ? Be careful there…. Make sure you know the facts before you go on and on, and finding out that you too, like many of us have been misled by Andrew Gopal and his supporters. 1. YB got Andrew and his committee to agree to an independent external audit of the club’s accounts. Funds were raised by the residents, a certified auditing firm was appointed in front of YB. Then Andrew Gopal did a 180 degree turn and did not allow the audit, citing that the constitution does not allow for it and ROS may deregister the club if the audit is done! 2. Andrew Gopal in front of YB proclaimed that the land is not a public land. This is against that the land is an open space for public access. 3. YB has requested Andrew Gopal to allow the residents to play football on the field (paying, mind you…not free) once a week. The answer from Andrew Gopal is ‘I have to check with my committee’…. And, until today Andrew Gopal has yet to give an answer. Now… Siapa bohong siapa ?? If you were to take a walk in our small village of Kuala Ampang, they will tell you who the biggest liar is.